SWEDEN’S Henrik Stenson carded his lowest score ever in a major as Tiger Woods recorded his highest in the US Open on a day of contrasting fortunes at Chambers Bay. Seeking to become the fifth European winner in the last six years, Stenson birdied four of his last six holes for a five-under-par 65 to share the lead with American Dustin Johnson. But there was more misery for former world No 1 Woods, who said on Tuesday he was willing to endure “short-term suffering for long-term gain” after coming into the event on the back of the worst score (85) and four-round total (302) of his career in the Memorial Tournament. Woods carded eight bogeys, one triple bogey and a solitary birdie in an opening 80, three shots more than his previous highest score while still an amateur in 1996. The only consolation for the 39-year-old was that he outscored playing partner Rickie Fowler, who shot 81 despite being inches away from an albatross on the par-four 12th. With Louis Oosthuizen shooting 77, Woods’s group were a combined 28 over par. Italy’s Francesco Molinari, Scotland’s Marc Warren and Masters champion Jordan Spieth were three shots off the pace after rounds of 68, with the 51-year-old duo of Colin Montgomerie and Miguel Angel Jimenez another stroke back alongside Phil Mickelson, who needs a first US Open win after six runners-up finishes to complete the career grand slam. World No 1 Rory McIlroy struggled on the greens in an opening 72, while Sergio Garcia admitted the putting surfaces were “as bad as they look on TV” after finishing level par. The greens were not the only difficulty either, with Stenson’s caddie Gareth Lord injuring his left wrist on Wednesday and Stephen Gallacher forced to replace his caddie Damian Moore due to a leg injury suffered on the same day. “Walking off the 16th he took the fall, both feet in the air, and got trapped with his wrist under the bag,” Stenson said. “He’s in a cast now. It might be broken or just torn ligaments. Johnson threatened to equal the lowest score in major championship history - 63 - when he reached six under par with two holes to play, but miscued a chip on the par-five eighth and bogeyed the ninth. 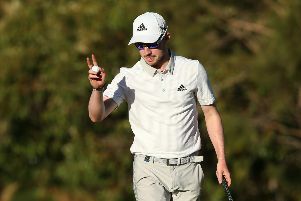 The 30-year-old won the WGC-Cadillac Championship in March, his first victory since taking six months out of the game to deal with “personal challenges”, a move which ruled him out of the Ryder Cup at Gleneagles and prompted allegations - which he has always refuted - of a positive test for cocaine. Warren, who is making only his second US Open appearance, birdied two of his last four holes. After being two-under early on, Dornoch’s Jimmy Gunn marked his major debut with a two-over 72, but Blairgowrie amateur Bradley Neil and Gallacher are already battling to make the cut after rounds of 76 and 78 respectively.